Ken Kaneki has finally regained memories of his former self, but this once again leaves him at a crossroads in the war between human and ghoul. 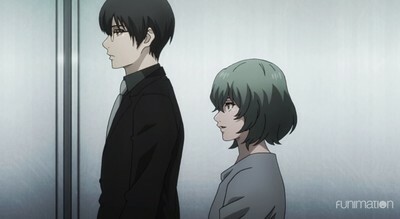 After donning a pair of glasses to mirror his mentor Arima, Kaneki’s new assignment is to manage the interrogation of Eto, the One-Eyed Owl, after she reveals her ghoul nature in a press conference about the publication of her newest book, which she claims will bridge the gap between the two warring sides. Now interred in Cochlea, Eto eagerly awaits the awakening of the “One-Eyed King”, but only Kaneki seems to understand what she’s really planning. As Aogiri Tree descends on the facility to rescue their leader, Kaneki turns to one of his oldest friends for help in his new secret mission. Tokyo Ghoul:re season 2 is based on a manga and streams on Funimation, Tuesdays at 11:00 AM EST. Look, I don’t want to admit that Tokyo Ghoul:re broke me, but if I’m being honest, I’m kind of ruined now as a fan trying to keep up with this story. The first two seasons of Tokyo Ghoul could be confusing, as they absolutely rushed through the manga’s material in ways that made being an anime-only viewer almost impossible, but the key word that kept me going was “almost.” I still love most of these characters, and there were still moments of beauty and poignance peeking through even :re’s diminished production effort and (somehow) even faster pacing, but watching Tokyo Ghoul at this point is just like watching the roughest possible digest version of a story that was already too ambitious and bloated in its original form. There aren’t any notable action scenes to open the season, it’s just an avalanche of exposition setting us up for the next arc. (Remember the Washu clan? Because I don’t, but I guess they’re going to be important going forward!) So if the animation already looks this bad on the talking heads in the premiere, I can’t imagine how rough it’s going to get when the ghouls start fighting. Unfortunately, there’s also no sign of the Quinx squad yet, our emotional anchors from the first cour of :re who deserved a lot better than they got. But most tragically, this is the first time in the history of Tokyo Ghoul that I have no idea what the protagonist’s motivation is anymore, and it would be hard to come back from that even in a well-paced and well-animated show. I’m afraid not even the tender reunion of Hinami and Kaneki can get me excited for another twelve episodes of impossibly rushed plot points and confusing character reveals. Tokyo Ghoul passed the “read the manga” line long ago for most fans, and the rest of us are stuck in the purgatory between seeing this story through to its end and finding any reason to care about the lackluster way it’s adapted. At least we’ll always have that killer soundtrack.